Ardis Bazyn and Kevin Berkery finish the Watermelon 5K run in one hour, fourteen minutes and forty-five seconds. That's 01:14:45 to athletics. 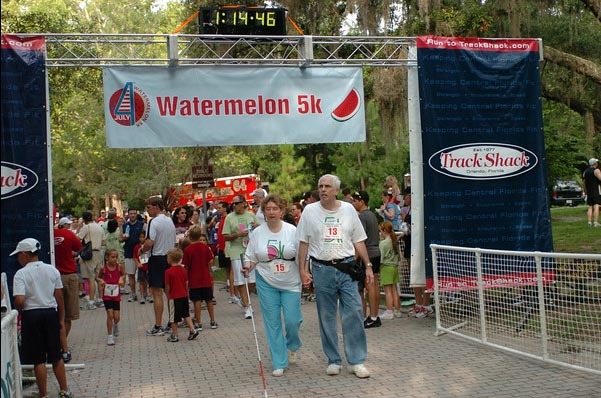 Watermelon 5k runners and walkers answered the call to support the United States Marine Corps' Wounded Warrior Regiment through financial contributions and donations of flip flops which will be sent to wounded soldiers during hospital stays. Funds and flip flops will be sent to Camp Pendleton, CA and Camp LeJune, NC Marine Corps Bases. The American Council of the Blind earned over $24,000 in sponsorships.